The Executive Board of the Eindhoven University of Technology (TU/e) has appointed dr. ir. 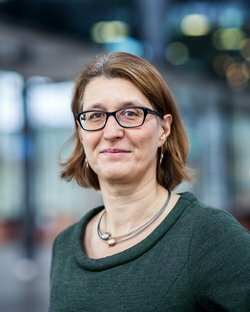 Anja Palmans as Full Professor at the Department of Chemical Engineering and Chemistry as of 1 April, 2019. Palmans is currently already working at the Department of Chemical Engineering and Chemistry as Associate Professor and is now taking the next step in her scientific career. She will occupy the chair ‘Supramolecular Chemistry & Catalysis'. The new chair profile for Full Professor Supramolecular Chemistry and Catalysis is partly a continuation of the current Associate Professor position of dr. ir. Anja Palmans within the Laboratory of Macromolecular and Organic Chemistry headed by Prof. Bert Meijer. However, the chair will have an enhanced focus on bio-orthogonal catalysis and folding of synthetic macromolecules into functional materials. Recently, the advanced integration of the fields of polymer chemistry, supramolecular chemistry, stereochemistry, with the novel field of bio-orthogonal chemistry resulted in new and exciting developments that will allow integration of biological and chemical processes to generate non-natural conversions in complex media. The development of new systems, materials, and concepts, and the increased understanding of the mechanisms underlying the formation of complex molecular systems via non-covalent, reversible interactions provide a solid foundation for this integrated approach to progress towards in vivo applications. The field of bio-orthogonal chemistry and catalysis is booming. It is believed that integration of catalysis in complex media with the help of polymer en supramolecular chemistry will provide new avenues forward and make synthetic systems available with enzyme-like activity and selectivity (“synthetic enzymes”). In addition, the highly interdisciplinary character and potential for applications attract a significant amount of international interest, and provide a challenging platform to educate future generations of students. A strong synergy is foreseen in the triangle bio-orthogonal catalysis, supramolecular folding of synthetic macromolecules and organic/polymer synthesis. Whereas the existing close collaboration with Prof. Meijer will remain, establishing a new chair in which integration of catalytic processes provides a red line will permit further international positioning of this exciting field. 1. Towards Synthetic Enzymes: Single-Chain Polymeric Nanoparticles for Bio-Orthogonal Catalysis in Complex Media. 2. Mastering Supramolecular Copolymerization Processes to Control Dynamics and Function.